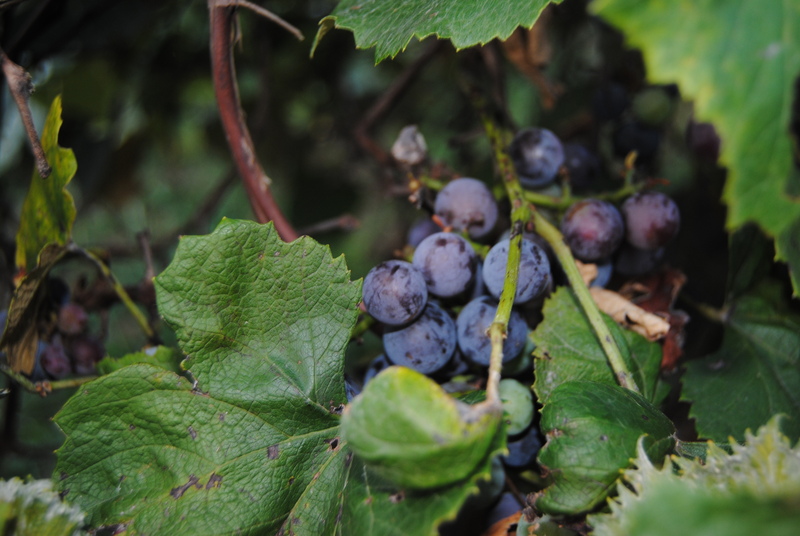 As a child, I enjoyed picking grapes off the vines that grew on my grandparent’s property. In all honestly, I don’t know if they belonged to my grandparents or another relative that lived next door, but I remember picking and eating those grapes. They were sweet and juicy, nothing like the grapes purchased from the grocery store. I also remember those grapes because they got me in trouble. Apparently, picking and eating them was not okay with my mom so when caught, I was punished. Had those grapes not been so yummy, I wouldn’t have picked them or eaten them. I just couldn’t resist the taste of those fresh, juicy grapes of wrath. Several years ago, when we started our first garden, I planted some grapes vines. I knew nothing about growing grapes, except for one thing – I wanted my own grapes that I could do with as I pleased. No one was going to scold me if I decided to sit out by my grapevines eating them fresh off the vine! These would not be grapes of wrath! I planted 3 vines and by the second or third year, one of the vines died. The other two have continued to produce grapes each season, but sadly I have done little to nothing with them. I never took the time to learn how to make jelly or juice. For a matter-of-fact, I haven’t taken the time to learn how to properly care for grape vines. After all the times of being in trouble for picking and eating those grapes in my childhood, I had my own grapes to pick and eat. Yet most years little to none of them had been touched, except by birds. Somehow, despite my neglect and lack of grape-vine knowledge, these two remaining vines have continued to grace our little piece of property. 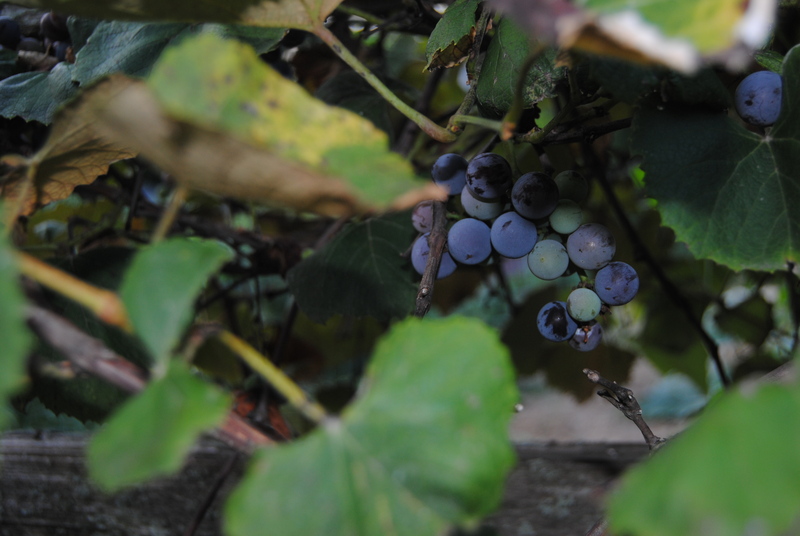 Like all the years past, our two little vines have produced lovely purple grapes. This year, however, they are not being wasted. 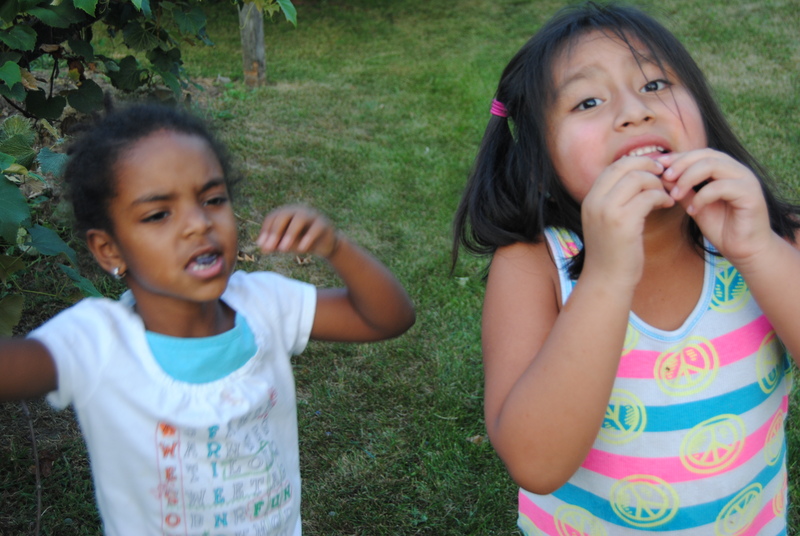 The girls and I have been going out, picking grapes and eating them fresh off the vine. They fill our mouths with a wonderful sweetness, followed by a little bit of tart and I’m immediately taken back to my childhood minus the wrath of my mom. Yes, it’s okay to pick the grapes and eat them. I will learn more about grapes and how to property care for them. I’ll learn how to make grape jelly and maybe even juice. No more vines will be planted on our property here, but one day we’ll find ourselves living in the country, with a bigger piece of land. That property will grace us with a nice assortment of grape vines and just like this year, you’ll find the girls and I out by those vines enjoying a sweet, juice snack.